Brown County was founded in 1855. It was named for Joseph Renshaw Brown, a member of the Governor's Council of Minnesota in 1855. 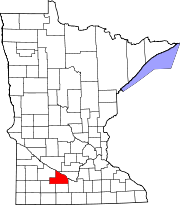 The Minnesota River flows east-southeast along the county's northern border. The Cottonwood River flows east-northeast through the county's central and upper area, discharging into the Minnesota at the northern border. The Little Cottonwood River flows east through the lower portion of the county, on its way to discharge into the Minnesota in neighboring Blue Earth County. The terrain consists of rolling hills, mostly devoted to agriculture, and generally slopes to the east, tending to drop into the river valleys. Its highest point is near its southwestern corner, at 1,257' (383m) ASL. The county has a total area of 618 square miles (1,600 km2), of which 611 square miles (1,580 km2) is land and 7.4 square miles (19 km2) (1.2%) is water. As of the 2000 United States Census, there were 26,911 people, 10,598 households, and 7,164 families in the county. The population density was 44.0/sqmi (17.0/km²). There were 11,163 housing units at an average density of 18.3/sqmi (7.05/km²). The racial makeup of the county was 97.82% White, 0.10% Black or African American, 0.12% Native American, 0.41% Asian, 0.01% Pacific Islander, 0.91% from other races, and 0.63% from two or more races. 2.03% of the population were Hispanic or Latino of any race. 67.1% were of German and 9.6% Norwegian ancestry. There were 10,598 households out of which 31.50% had children under the age of 18 living with them, 57.30% were married couples living together, 6.90% had a female householder with no husband present, and 32.40% were non-families. 29.00% of all households were made up of individuals and 14.30% had someone living alone who was 65 years of age or older. The average household size was 2.43 and the average family size was 3.00. The county population contained 25.30% under the age of 18, 9.70% from 18 to 24, 25.60% from 25 to 44, 21.90% from 45 to 64, and 17.50% who were 65 years of age or older. The median age was 38 years. For every 100 females there were 98.20 males. For every 100 females age 18 and over, there were 95.90 males. The median income for a household in the county was $39,800, and the median income for a family was $49,811. Males had a median income of $32,347 versus $23,918 for females. The per capita income for the county was $19,535. About 4.40% of families and 6.40% of the population were below the poverty line, including 7.00% of those under age 18 and 9.80% of those age 65 or over. ^ Minnesota Atlas & Gazetteer. Yarmouth ME: DeLorme. 1994. pp. 21–22, 30–31. ISBN 0-89933-222-6. ^ a b "Monthly Averages for New Ulm MN". The Weather Channel. Retrieved November 6, 2011. ^ "Population of Counties by Decennial Census: 1900 to 1990". US Census Bureau. Retrieved October 5, 2014. Louis Albert Fritsche, History of Brown County, Minnesota: Its People, Industries and Institutions. In Two Volumes. Indianapolis, IN: B.F. Bowen and Co., 1916. This page was last edited on 13 April 2019, at 12:56 (UTC).